An overview of how common methods are used and how their use has changed over time. Why you should avoid drop-down meus in your UI. Illustrate complex processes by including use cases, actions, and life cycles. Design reviews and feedback at every stage of the design process is both helpful and crucial for a successful product. How and why we perceive things the way we do. Build websites? BugHerd makes client feedback simple, visual & pain-free. 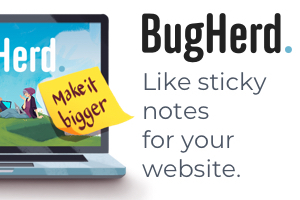 Like sticky-notes for your website, BugHerd turns client feedback into clear actionable tasks complete with screenshots, browser info, CSS data and more. Trial for free today. Free MIT licensed PSD illustrations, in 2 styles. An image compression web app that allows you to dive into the advanced options provided by various image compressors. Videos from this year’s Leading Design conference. Google UX Director Margaret Lee on redefining design leadership and inclusivity in the workplace. Seth Godin reminds us to do work that matters, for people who care by focusing on serving a minimum viable audience. Ismael is a product designer who worked as an intern for AirBnB. Knowde is looking to add an immensely talented UX/UI designer to help invent, design, refine and deliver their products. If you know anyone that might enjoy UX Design Weekly, please share this issue with your friends and colleagues.